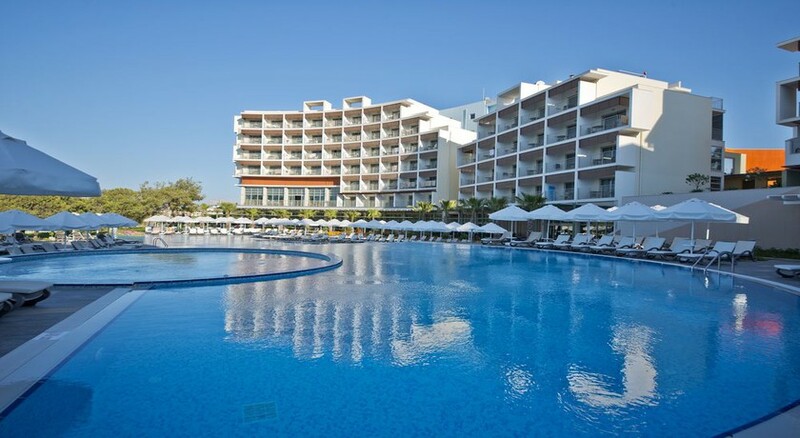 TUI Sensatori Resort Sorgun by Barut Hotels is modern all-inclusive hotel for luxurious Antalya holiday stay with three separate areas designated for adults and families with children. Sitting pretty on a private section of a fantastic sandy beach, the hotel complex occupies an extensive area overlooking the stunning Mediterranean Sea and the verdant pine forests as the perfect backdrop. With well-furnished rooms, multi-speciality restaurants, bars, luxurious spa and a host of activities to keep residents occupied, TUI Sensatori Resort Sorgun scores highly as a perfect accommodation choice for holidays in Antalya. A fabulous terrace with a pool, pool bar and sun-chairs entices the serious sun worshippers. The hotel is very well connected by public transport and taxis, so you can roam around and explore the old town and Roman walls, or the golden sandy beach nearby. Hit the azure waters of the Med, or take a dip into the hotel’s pools during the day, later pamper your body and soul with spa treatments – your search for the perfect holiday experience ends here. 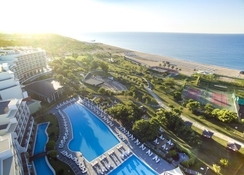 TUI Sensatori Resort Sorgun is located right on the beach in Antalya. The beach is less than a minute’s walk from the property. The hotel falls in the Sorgun District and is only 5km away from the resort of Side. It is also 6km from the nearby town Manavgat and 68km from Antalya airport, which is an hour’s drive. The Aktur Lunapark is 6km from the hotel. TUI Sensatori Resort Sorgun offers an array of beautifully appointed and modern guest rooms and suites to suit every budget and requirement. Whether you are travelling as a family, with friends or as a couple, TUI Sensatori Resort Sorgun will impress with its variety of accommodation options. Room categories include double rooms, superior rooms, family rooms and adult rooms, as well as plusher rooms that feature rainforest showers, whirlpool baths, private pools and swim-up abilities. These air-conditioned rooms are equipped with en-suite bathrooms, telephone, Wi-Fi, music channels, LCD TV, hair dryer, safe, tea and coffee set, minibar and a balcony. Some of the rooms even come with Jacuzzi, whirlpools and rainforest showers. The hotel has a selection of rooms that are accessible for physically challenged travellers. There’s a clutch of excellent restaurants in TUI Sensatori Resort Sorgun to cater to your palate. The main buffet restaurant serves all major meals of the day. Among other dining options, there is Safran Restaurant for traditional Turkish food, Olive Restaurant for Italian cuisine and Ocean Restaurant for seafood delights. There’s also and a BBQ restaurant Aqua and Tarçın Restaurant for fine dining during evenings. Note that dress codes are strictly formal and cover charges may apply. 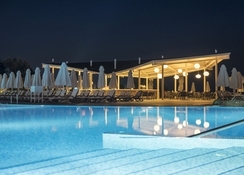 Among bars, the hotel has Ocean Beach Bar, Aqua Snack Bar, Sorgun Lounge Lobby Bar, Yasemin Adult Pool Bar, Club House Bar and Butterfly Bar that serve a range of alcoholic and non-alcoholic drinks. The hotel provides an excellent array of sports, games and fun activities for both adults and kids. These include swimming pools, beach volleyball, tennis courts, archery, table tennis, snooker, step and aerobics. There’s a fitness room as well as an outdoor fitness area for health enthusiasts, while water lovers can enjoy the watersports centre or have fun the inflatable water slides. For relaxation, head to the botanical garden or the private cabana at the beach or the garden. If you want more pampering, the on-site spa centre provides Turkish bath, massage and body and facial treatments. Younger guests have mini club, playground, electronic games, child’s buffet and kids’ pools for enjoying a fun-filled holiday at TUI Sensatori Resort Sorgun Antalya. Other recreational amenities include open-air theatre, animation, shopping centre, mini market and lots of entertainment activities. The resort is 1 minute walk from the beach.